I hooked up my boyfriend with a free Graze box code so he could try it, and his first Graze box finally arrived! I ate most of the snacks because he just got back on the Lose It app and I had ordered this for him before he did. I did switch over his profile to the lower calorie box that have snacks between 50-150 calories for each pack, so we'll get a chance to try those as well. He says he wants to keep subscribing because then there will be snacks at his house for when I come over! Apple and Cinnamon Flapjack - These flapjack snack packs are wonderful! I see why many like them, they're like really chewy granola bars, but not too sweet. Which is good because I am sensitive to foods with too much sugar. Spicy Corn Taco - I've had this one before in my first Graze box, and like I said, it's like fancier corn nuts and better tasting. Great if you like crunchy snacks like I do! Cookies and Cream - This was a good one, but the sunflower seeds just seemed like filler. Cherries and Berries - Dried berries, this was a good one, would probably be wonderful on cereal in the morning or yogurt. 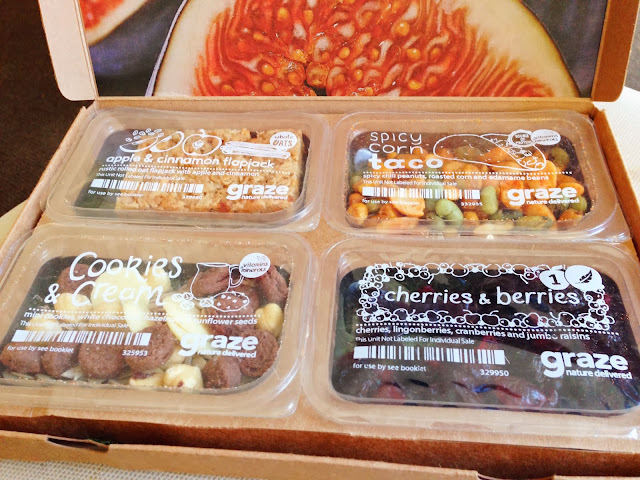 Graze is $6 a box, and you can chose how often you receive the boxes, every 2 weeks or every 4 weeks. If you want to try Graze for free, here's a link to a free box. They'll give you the first box free, and you can cancel after that if you'd like, or if you stick with it you'll also get the 5th box for free as well!